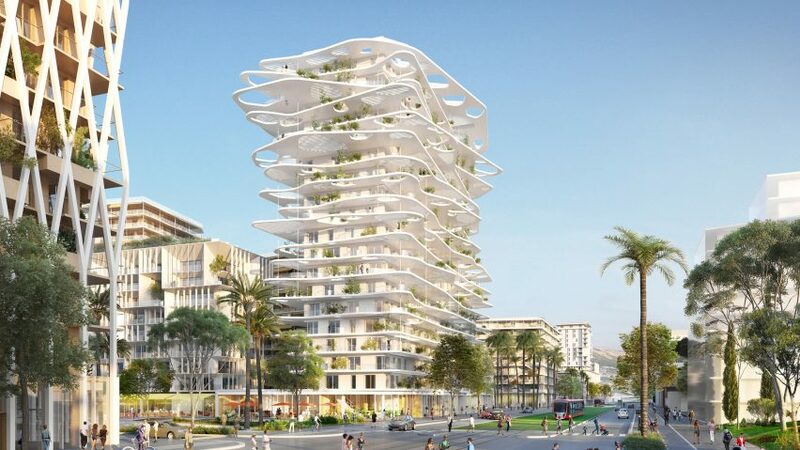 A tower with undulating, tree-covered canopies by Japanese architect Sou Fujimoto forms part of this competition-winning €275 million masterplan for a new neighbourhood in Nice, France. 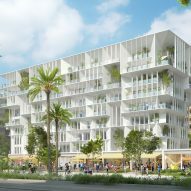 French firm Lambert Lénack led a team that includes architects Sou Fujimoto, Cino Zucchi, Chartier Dalix, Laisné Roussel, Anouk Matecki and Roland Carta, and landscape architect Alain Faragou, to win the competition to design the complex. 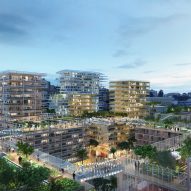 Called Joia Meìridia, or Destination Méridia, the proposal details plans for a mixed-use development of 800 residential units, plus a hotel, shops and offices arranged around public spaces. The brief called for designs that referenced the regional architecture of the French Riviera and that would be well suited to a Mediterranean climate. Each architect worked on a different part of the masterplan. Sou Fujimoto's contribution is Méridia Tower, a 54-metre-high white tower block. The building will be wrapped in wavy contoured terraces supported by thin columns, which double as canopies for the balconies below. Cut-outs, some slatted and some left open, will allow a controlled mix of light and shade to reach the levels below, which all feature greenery in some form. These details echo the projects that the Hokkaido-born architect – who ranked at number 32 on Dezeen Hot List 2017 – has built his reputation on. Examples include his "forest of light" for COS and his recent proposal for a plant-covered tower complex in Brussels. Plants and trees feature heavily throughout the rest of Lambert Lénack's 73,500 square-metre masterplan. It contains 2,000 square-metres of green space, including a vegetable garden, an aromatic plant garden and an "experimental" garden. Lambert Lénack said its had conceived the project around the idea of "diaphanous minerality", which it described as "a play of shadows and lights to enjoy the view and the sun, while guaranteeing islands of freshness". The masterplan organises the new buildings around three main squares. 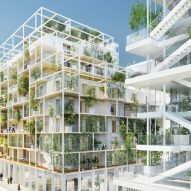 Sou Fujimoto's tower will face Metropolitan Square, along with a series of high-rise buildings. Meridia Plazza is designed to be a modern reinterpretation of the traditional squares of Nice. 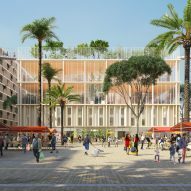 The Patio will sit inside Cité du Bien-Être, a 5,000-square-metre sports and wellness centre designed by Laisné Roussel, creating a "micro-climate of shade and freshness". This Parisian architecture studio has form when it comes to diaphanous architecture – for the first architecture biennale in Lyon in 2017, it created a white metal tower and slide overflowing with flowers. Joia Meìridia is due to take six years to complete, with the first buildings delivered in 2021.